The seats have an incredibly comfortable seating angle and each side has a swing arm. This item is easy to assemble and low-maintenance. You get the best price because they are directly from manufactory. NEW PRODUCT WITH FACTORY PACKAGING. -Able to swing two people with comfortable seat. -Perfect for any outdoor living area. -Four removable cushions totally provide more comfort. 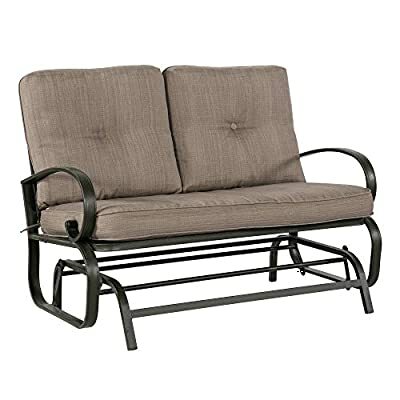 -Durable tubular wrought Iron construction. -Seat and back cushions with two straps can be fixed. -Frame is dark brown (a bit bronze) color. 2. 24 hours later, after we confirmed shipment, the cancellation of the order will not be allowed. If you still want to cancel it, the carrier will charge $12 for the recall plus shipping costs. After the item is returned to the warehouse, we will issue the refund deducting the relevant fees. 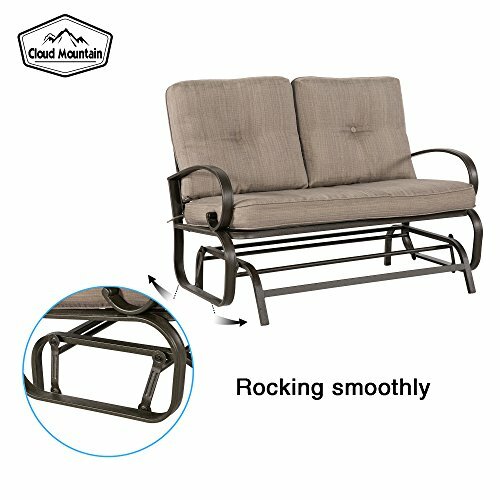 ?ROCKING GLIDER LOVESEAT? : Sit down comfortably and feel the smooth of the glider, gentle backward and forward motion of this exquisite chair. No rough rocking back and forth; just a soft gliding like a breeze; the perfect gift for you, your significant other, or your loved ones. ?COMFORTABLE CUSHION? : This loveseat features durable Sponge (Interior) / Olefin fabric (Cover), which is strong and easy to clean. At the same time, the fabric texture remains soft to the hand & cushion covers remove with a quick zip! Seat cushion with tether to fix it from being blown. 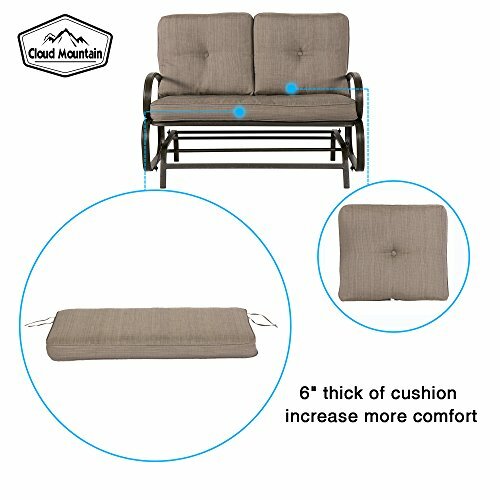 Cushion with 6" thickness gives you the best experience than others. ?ARTISTIC STRUCTURE DESIGN? : Our loveseat glider is designed with unique artistic of circle elements. 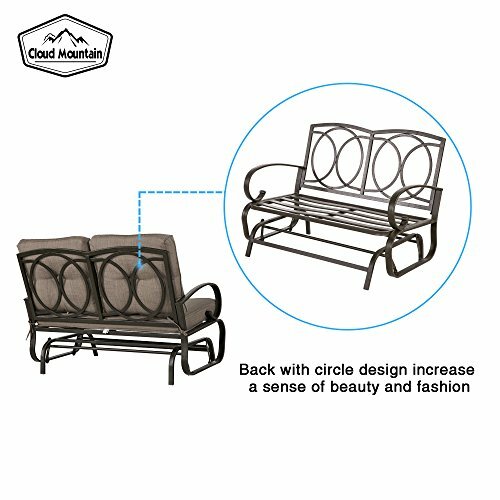 It is not only for more modern and sylish for your garden, but also it can provide the maximum weight capacity to sit. Durable wrought iron frame for a long time use. ?HUMANIZATION ANTISKID FOOT? 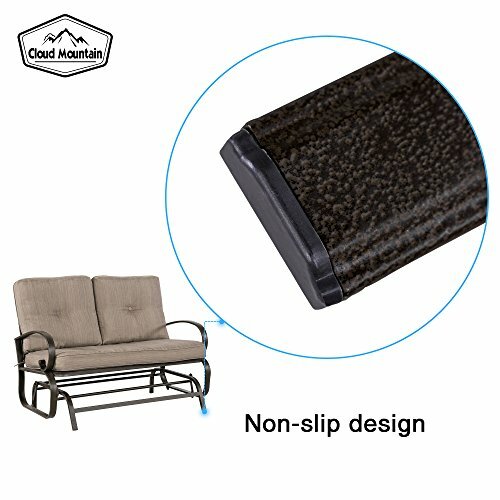 : Our loveseat is attached with anti-skid rubber foot cushion, which can effectively protect you from sliding when you are sitting in chairs and. It is safer than others. ?PROFESSIONAL CUSTOMER SERVICE? : 1-YEAR WARRANTY is covered for this set. 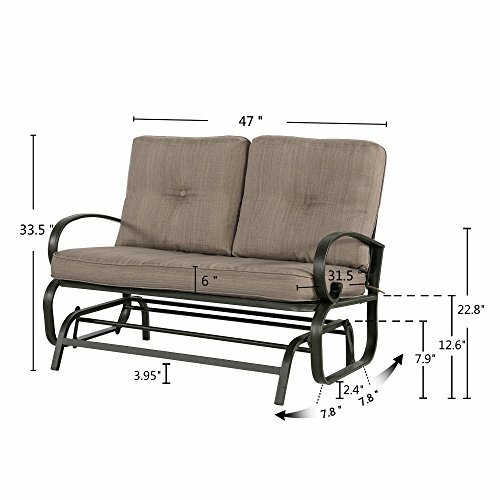 Our outdoor loveseat glider includes 1 loveseat, 1 seat cushion, 2 back cushion. The whole set is directly shipped from US in 1 box. All package should be delivered well branded and sealed. If you find any damage caused in transit, please contact us directly to solve your problem without hesitation. Our customer support team will reply to your message in 24 hours about any issue with your orders.